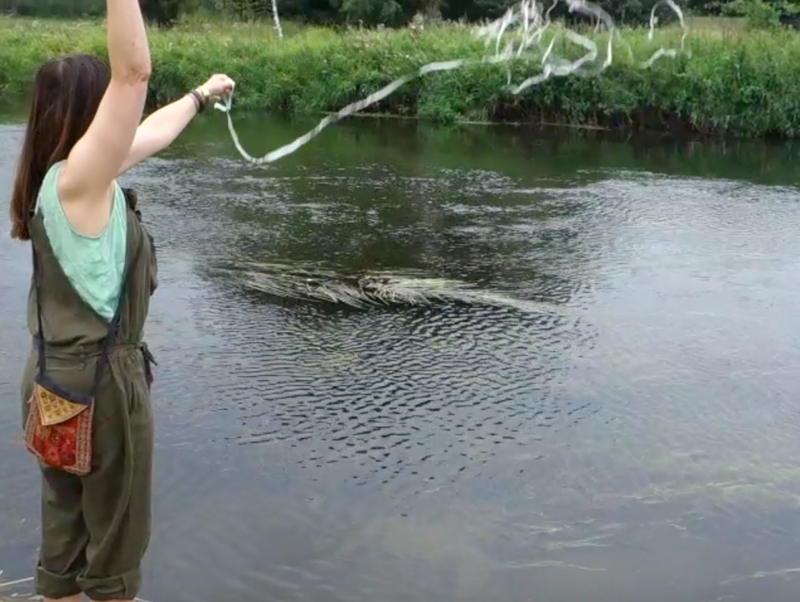 Cold Water Wash - a Sunday collaboration with filmmaker Anna Cady for the 60 Second Film Challenge, Stroud Film Festival 2018. Cold Water Wash - a Sunday collaboration between Anna Cady and Patricia Brien for the 60 Second Film Challenge, Stroud @FilmStroud Festival. Theme = COLD WATER. Sladebank hosts several community groups including the Red Hearth, the weekly women's group, Wolf Sisters, Moon Daughters and mothers. Inspired by these different groups I inititiated a small project to insulate and embellish the roundhouse space with woollen padding and red woollen thread. The woollen panels had been gifted to Kesty Jakes the holder of the land and community. The idea was to create a practical and fine wall hanging with the ‘voices’ of the community. Women and girls of different sewing skills levels joined in stitching something of themselves onto the woollen panels which were then stitched together to form three wool panels. As part of my researcher / artist in residency at Atelier, Stroud, Monday evenings became the spill out sessions to complete the work. Four of five panels stitched & embroidered by over 40 women and girls associated with the Sladebank Woods community, Stroud. Exhibited at 'Honouring the Divine Feminine', Landsdown Gallery, Stroud. Dates: 5th - 10th March, 2018 as part of the International Women's Day (week) celebrations. 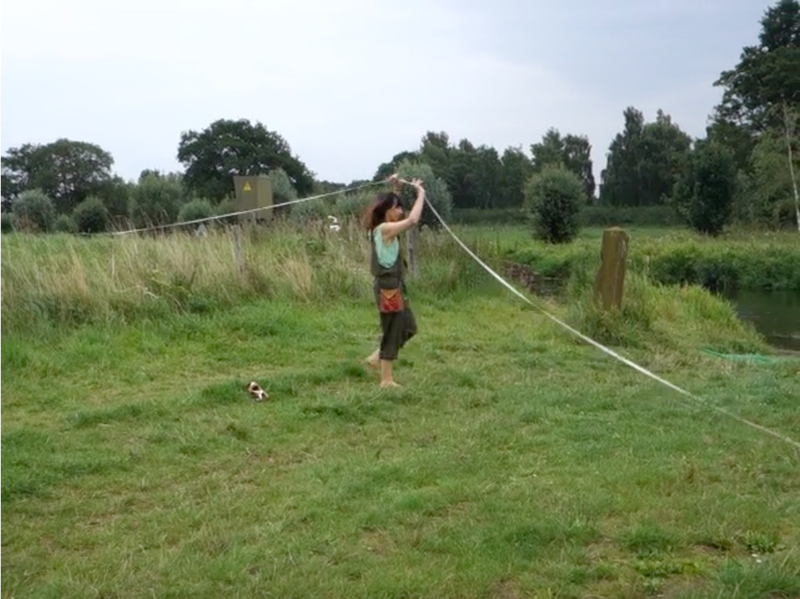 This project was an initial 'summer travelling' piece after I received Sabine Kussmaul's elastics kit and an invitation to work with them in my own practice. Sabine is a UK-based German artist (www.sabinekussmaul.com) who's work features sketching, video, photography and the natural world. My work with the elastics was an exploration of the game of 'elastics' that I played as a child where several children would hold the elongated elastic band and we would skip, jump, and flip through the bendy elastic lines, the level of difficulty rising as the elastic band wound it's way up our bodies in synchronicity. It was super fun! In this instance, as part of my practice with the more than human world, I am playing with water, air, plantlife, temperature and sunlight on the banks of the Niers in NL where we visit regularly. It is a place of much significance for my partner who comes from this part of the world. A stitch in time is a live installation curated by Patricia Brien exploring real or fabricated connections to clothes. Participants may project into the past or forward into the future finding people, places, experiences and narratives that are embodied in an object of clothing. As part of this live project participants are asked to bring along a piece of clothing or textile accessory that has significance - or indeed no personal significance - and stitch real or imagined holes, stains, tears, or marks to highlight, commemorate, mend or anticipate moments that will feature as the article is worn in the future. The punctum need not be seen, tucked away inside like a secret or it may be loudly embroidered for the world to see. The audiovisual stories will be live streaming from Atelier Stroud with fellow creators joining the storytelling & stitching at different times from Amsterdam, Melbourne and Bogotá. Spiritus Loci is the collaborative project designed and curated by Patricia Brien as part of her MA (Design) Textiles. Eight Melbourne-based textile/fashion designers & artists of various specialisations, sought individual relationships to local meaningful nature spots throughout the season of spring using the material qualities of hemp and the narratives of place. Artists: Claire Beale, Patricia Brien, Gabriella Ferrante, Kate Kennedy, Emma Lynas, Tasmin Pascal, Ria Soemardjo and Ilka White. The film sought to document the participants' rituals and is a reflection on place, meaning and textile artefacts. A short film collaboration for Spiritus Loci shot and edited by Karan Jones and Amanda Magnano. Spiritus Loci from Karan Jones on Vimeo.